An article to express one’s opinion, judgments, ideas and perception about an event, incident, person etc is known as evaluation essay. Also known as evaluative writing and critical evaluation essay, it provides proof to give an explanation for the author’s opinions about a topic. To write a good evaluation essay that critically analyzes a topic well and justifies your observations, following are some quick tips to keep in mind. The first part where the readers’ attention goes is the headline, thus keep it short, crisp and catchy. Frame a title directly related to your subject and how you evaluate it. For example, suggested a title for writing an evaluation essay on harms of video games can be ‘Video games poison the human psychology’. Testimonials are a crucial part of an evaluation essay, as they justify your statement. For each fact, you present in your work, make sure you have at least one proof to support it. It would be inappropriate to judge a situation without presenting proofs, as your statement may seem formless without them. For writing a good evaluation essay, one must have strong opinions, which have the strength to convince the readers. Hence, you should also choose wisely whether you write in favor of the topic or against it. The perceptions and ideas you share must be valid, have a firm supporting evidence and should be detailed as well, to make the voice of your words stronger. Before beginning to write the actual essay, make a rough outline of your work. Write down the points you wish to include, plan the sequence of all the details and work well on the strong points. A good evaluation essay comes up only if you have worked well to achieve it. Writing a high-quality evaluation essay is not an easy task. It requires a thorough understanding of the elements, composition and nature of evaluative essays. Students often require an exemplar evaluation essays or best evaluation essay samples based on which they can understand the format of writing such essays. Assignmenthelp.net offers to write my essay services for online evaluation essay writing. Our team of expert essay writers and essay editors have an experience with writing best college and university essays in various formats including compare and contrast essays, Narrative Essays, Expository Essays, evaluative essays, argumentative essays, cause and effect essays, Response Essays, reflection essays and many other varieties of college custom writing services. Not only do you get to hire an expert essay writer online but also get free essay plagiarism check service and guidance for essay editing and proofreading. Looking for help with evaluation essay topics? 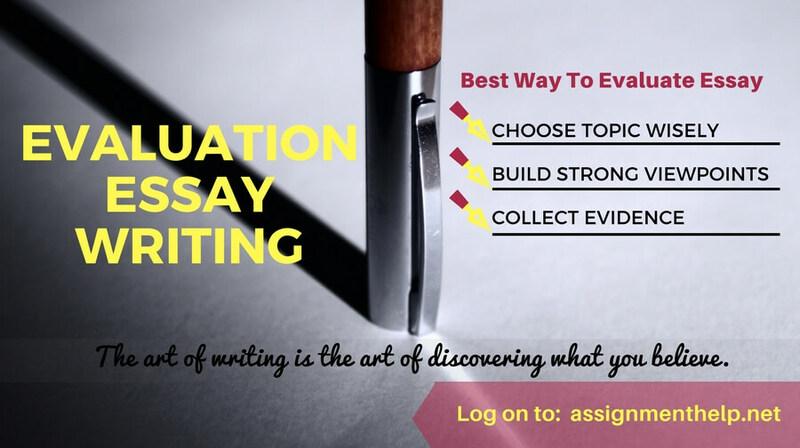 Our team of essay writers have also compiled 100s of best evaluation essay topics and will help you to choose the best essay topic according to your requirements. So, don’t wait and order now Online Essay Writing Help service for evaluation essay writing from Assignmenthelp. Write an Evaluation Essay to Evaluate the recent performance of your favorite sports team. Evaluate the healthcare program in your state. Evaluate the experience of playing basketball (or any other sport) in your college. Evaluate the way social media sites impact modern-day social relationships. Evaluate a recent horror movie for how it portrays horror. Evaluate the experience of using digital e-books compared with the traditional paper books. Evaluate the climate change policy of Obama Era. Evaluate the recent health care reforms the USA. Evaluate the impact of Civil Wars in USA on the social development of US society. Evaluate the impact of Rising of Intelligent Machines on Manufacturing Industry. Evaluate your favorite foreign cuisine. Evaluate the modern racial biases existing in today’s France. Evaluate the role played by Dairy industry in Greenhouse Gas Emissions. Evaluate the usefulness of medical marijuana. Evaluate the evolution of photography at least 10 decades. Write an Essay to Evaluate your Dining Experience in a Michelin Starred Restaurant. Evaluate the introduction of a geographic information system (GIS) and its impact on urban planning or real estate market.